Use UniPunch tooling to punch holes in extrusions, tubing, structural parts and more. How can we help you make holes faster? A manufacturer of animal enclosures was punching flat bars one hole at a time with an ironworker. It was time consuming and the hole-to-hole accuracy was difficult to maintain. He started punching all of the holes in one hit with the UniPunch system and went from making 60 parts per hour to 600! They’re Not Just for Bending Anymore! Press brakes are an important resource for punching holes fast. 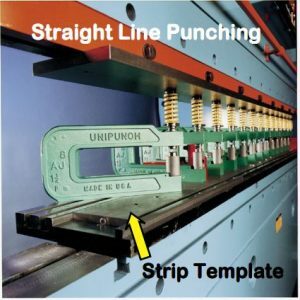 One of the most common applications is punching a line of holes using UniPunch tooling on a strip template in a press brake. For recurring jobs, UniPunch tooling can stay assembled on the template and the whole assembly can be removed from the press and put on a rack for when that hole pattern is needed next. There are a variety of ways to reduce the required press tonnage. Proper clearance between the punch and die is essential for piercing a well-made hole efficiently. Too much punch and die clearance results in more rollover deformation where the punch enters the material and a large burr on the die side. With proper clearance between the punch and die, there will be minimal rollover deformation around the hole where the punch enters the material. As the punch cuts through the material, it creates a region of vertical burnishing until the fracture line created by the punch meets the fracture line defined by the size of the die at which time the material breaks creating the hole. On the die side there will be a minimal burr.